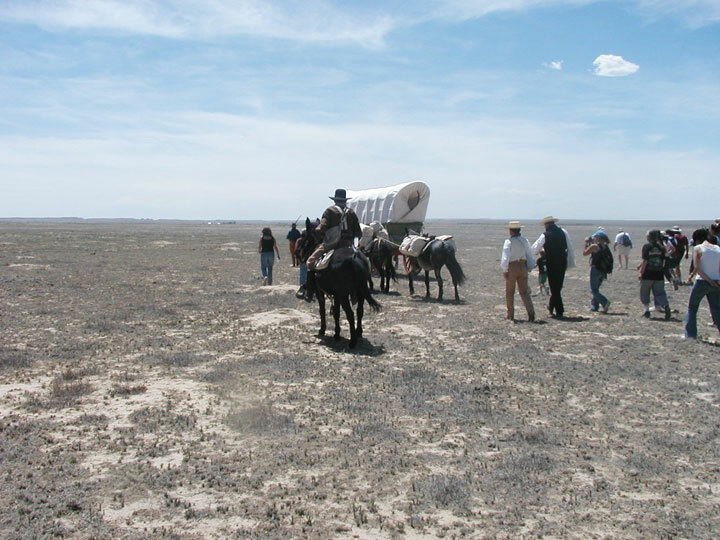 The Santa Fe Trail served as the region’s first commercial highway, fueling trade and military activity during the Mexican-American War. The Purgatoire River region and surrounding area is particularly rich in paleontological, pre-historic and historic resources including the longest dinosaur trackway in North America, extensive rock art, rock shelter and tipi rings, and hundreds of early homesteads and support structures including many which are still used by third and fourth generation ranch families. The potential expansion of the U.S. Army’s Pinon Canyon Maneuver Site that could encompass hundreds of thousands of acres in the four counties. This could include the transfer of Comanche National Grasslands and condemnation of private lands. Colorado Preservation, Inc. received a grant to undertake a historic resources survey of the region. The first phase of the project, begun in 2008, where over four hundred sites were found that possessed significance for prehistoric archaeology, historic archaeology, and architecture. The majority of sites were related to a Homesteading boom that took place during the early 20th century. A second phase has begun that is focused on completing and submitting National Register Nominations and developing cultural tourism. The Army continues to pursue expansion; recently releasing a draft Environmental Assessment for the stationing and training of a heavy Combat Aviation Brigade. The proposed training area for the CAB includes hundreds of thousands of acres of private lands and the Comanche National Grasslands, as well as a large section of the Historic Santa Fe Trail. With a potential annual average of 22,957 flight hours, at altitudes as low as 50 feet, this training will expose the cultural landscapes, historic resources and the fragile environment to vibrations, sand blasting, and the introduction of negative visual and noise effects. Any expansion, whether through the acquisition of additional land or through the use of surrounding airspace, will adversely affect the historic resources and the agricultural economics of the region.